Welcome to the Supporters of Durham 150 newsletter, designed to keep those interested in Durham’s 150th updated on planning. Welcome to the Supporters of Durham 150 newsletter, designed to keep those interested in Durham’s sesquicentennial updated on all the planning activities surrounding the yearlong event. The Opening Celebration Committee is planning a celebratory event to bring the community together and formally kick off the anniversary on Saturday, April 13, 2019. Save the date and stay tuned for more information. Are You a Friend or Follower of Durham 150? 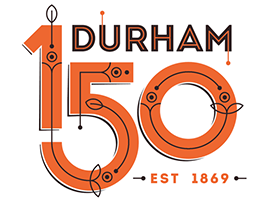 Visit the Durham 150 website. Additionally, follow us on Facebook, Instagram, and Twitter at @DurhamNC150. Be sure to follow us on social media to learn more about Durham 150 endorsed events, how to list an event on the event calendar, and how you can submit for a grant to support your event or project. We will be out in the community to spread the message about Durham 150 and to encourage involvement. Below are dates and locations where we’ll be providing information about the project and how to lend support. February 19 – 5:30-6:30 p.m.
* Please RSVP to attend the above event by sending an email to contact@durham150.org. February 28 – 3-7 p.m.
Are you interested in hosting an event or coordinating a project you or your organization will be doing in 2019 that aligns with one of the four Durham 150 themes (Art & Leisure, History & Education, Innovation & Entrepreneurship or Social Equity & Robust Democracy)? Visit www.durham150.org/submit-an-event to submit your event or project for endorsement by the Durham 150 project! We want all Durham residents, friends, and supporters to stay up to date on Durham 150 celebrations and events. Please forward this e-mail to friends, neighbors, and co-workers who wish to receive updates on Durham 150. Better yet, send them this form. Who or what represents Durham to you? The Durham Arts Council is asking visual artists to submit work that captures the spirit and diversity of the Bull City. Selected pieces will be included in the upcoming exhibit “Portraits of Durham,” on view at the Durham Arts Council March 15 – May 2, 2019. The “Portraits of Durham” exhibit will coincide with Durham’s official sesquicentennial commemoration, Durham 150. The themes explored in the exhibit will be in keeping with Durham 150’s mission: recognizing Durham’s past, present, and future, honoring the changemakers who shaped Durham’s unique sense of place, promoting ideals of inclusiveness and shared prosperity, and celebrating the community’s spirit, values, and accomplishments. For detailed information about submitting your work for consideration, download this PDF, or email Susan at stierney@durhamarts.org. Submissions must be received no later than Friday, February 22; there is no fee to apply. Find a listing of all events here. Your involvement is needed to help plan and execute a dynamic, yearlong observance that includes everything from a community-wide family reunion and series of events to celebrations of our roots and all that lies ahead. Visit www.durham150.org/donate-now to donate to help make the Durham 150 vision a reality! You received this email because you are subscribed to emails from Discover Durham. If you prefer not to receive emails from Discover Durham, you may unsubscribe from all future emails or set your email preferences.